Having to be so close to achieving a major goal in one’s music career is an overwhelming experience. 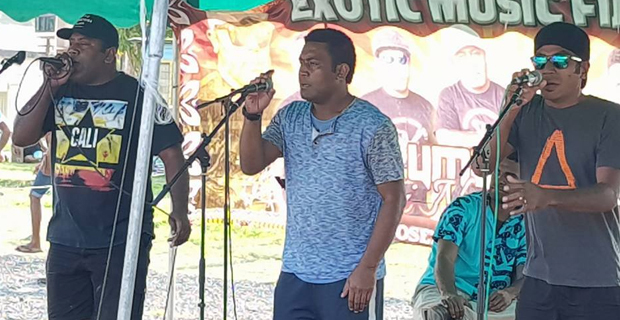 These were words of Malumu ni tobu Kei Naivaukura front man Jio Sefa who says that it will be a great task for his band to be performing at the 19th FM96 Annual Fiji Street Party Big Night Out with Coca-Cola. The former student of Ratu Kadavulevu School says that he was humbled when they were invited to perform and be part of the biggest New Year’s party in the Pacific. Sefa says that he first heard of the event as a student at Delanakaikai and having a passion for music he has always had the dream to one day perform at the Street Party. The 32-year-old says that being part of the major event will be the highlight of the year for him and the band adding that people should come out in numbers to celebrate with great live music. Meanwhile, Fiji Bus Operators Association has confirmed that bus companies will be providing bus services throughout the night on all routes between Suva to Nausori, Suva to Navua and also in the Suva vicinity to meet the demand of people celebrating New Year’s Eve. Fiji Taxi Association General Secretary Rishi Ram says taxi services will be widely available throughout the night. The 19th FM96 Annual Fiji Street Party Big Night Out with Coca‑Cola will be held from this Sunday from 8pm to 1am Monday at the Suva Foreshore. You can watch the FM96 Annual Fiji Street Party Big Night Out with Coca-Cola on livestream on our website fijivillage.com, Facebook page fijivillage and YouTube page Fijivillage.